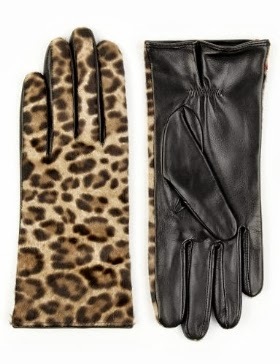 A leopard print themed Christmas wish list! We are into November now so I feel it's safe to start talking Christmas! Marks and Sparks isn't somewhere I normally shop but after a recent peruse around their Bath store I realised that they pretty much have Christmas wrapped up for me! The idea for my leopard print themed wishlist came from my lovely friend Jane from My Midlife Fashion. Her love of all things leopard print is well documented! In fact she wears any animal print so well that she has inspired me to get a bit more of it in my life as I am seriously lacking in it bar a few scarves! I've recently mastered mixing the check & stripe look.....so now I totally want to nail the animal print action! I admit to not being as confident with bold patterns as I'd like to be so I'm starting small.....but I am endeavouring to do my bit for Bet! 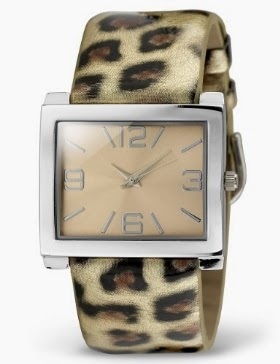 A girl can never have too many accessories so first up is this lovely watch! Or how's about these glorious gloves? They have more than a few lovely leopard print scarfs....they literally catering for everyone's style and pocket! But since it's Christmas I've plumped for the luxe Pure Collection cashmere because I'm worth it! 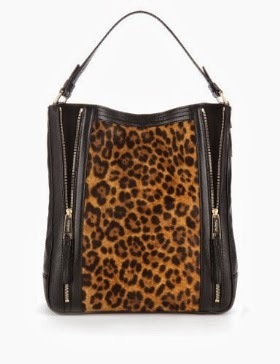 They have really exceeded themselves on the animal print front with this lovely selection of bags! I won't be happy if I don't find one of these in my stocking! This is my favourite as it could be an oversize clutch or crossbody bag, it's so versatile.......that's why it's top of the wish list! The shopper would probably be the most practical for me as I still seem to carry everything but the kitchen sink! 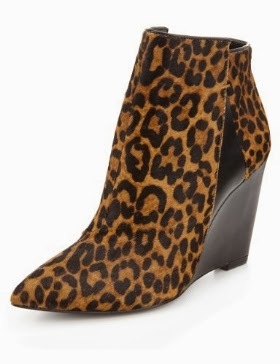 M&S have surpassed themselves in the style stakes with these amazing wedge boots....how gorgeous are these! I have it on good authority that there is 20% off M&S footwear until Sunday 3rd......so race you to the checkout!! And then there are these......how wonderful are these courts?! These would be a great height for me! Also love the muted tones on this print. There are a couple of other styles on offer as well.....again something to suit every one in heel height and budget-wise! You will no doubt remember my fondness of a blazer....this one ticks all the boxes! Such a great length and shape! And I couldn't leave you without adding a stunning Limited Edition coat! It's purr-fect! Good old M&S have come up with some corking gift ideas! Of course now all I need to do is make sure the DH catches sight of my wish list......I've made it easy for him this year as he need only visit the one shop! If you read this Mr Lee......I would be happy with any or all of the above! Onto what I've been wearing these past few days. First day of the school holiday.....spent enduring 3 hours of softplay! Anything here floating your boat?! Have you started compiling your Christmas wish list yet? What is likely to be top of your list? Love to hear your thoughts! Oh I have been slack. Been away for a few days and slowly getting back in to reading and catching up with my fave blogs. 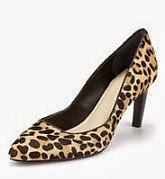 And I have my eye on those leopard heels too - I feel that my wardrobe would definitely benefit from a pair of those to make me feel a little more current. And I didn't know about the 20% off shoes in M&S - thank you very much missus. Off to do my bit for the economy! Looking fab as always Michelle. Love your berry Baxters. 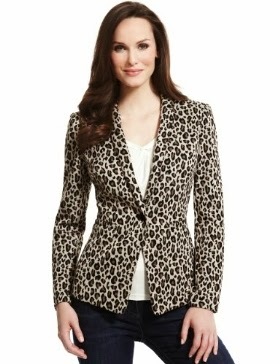 I think I saw the leopard print blazer earlier in the week when I popped into M&S for some bread!! If it's the one then it's really nice. Very stretchy and comfy. Also loving those wedge boots but I'm still holding out for the Michael Kors ones. 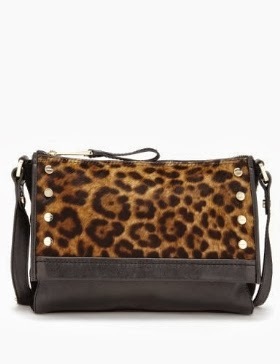 I have the small leopard bag. I bought it after seeing it on the Frugality blog. The bag is amazing and I love it! Somebody asked me if it was from Whistles. I got 20% off on friends and family day which made the purchase even better. Great blog! You lucky thing.....I would love the LV scarf, how fabulous! I absolutely love those leopard print wedges. I was very amused one day in Marks, when I stood admiring them ... and two 'elderly' ladies came past and remarked that they were truly awful and who on earth would wear them! I decided that probably wasn't the best moment to try them on !! Lol Helen! I can just imagine 2 little old dears passing judgement on those leopard print bad boys!! Tut tut!! Aren't we all embracing the leopard print at the moment!! Sounds like you have done so well birthday girl!! Gorgeous shoes and gorgeous blazer! I like the yellow-ish leopard print better than the orange one,it's more subtle. That shopper is ace too. I would be ecstatic with any of the bags.....but then I am a bit of a bag junkie!! Hi there! Wow what a coincidence, i bought the pointy wedge leopard boots this afternoon, they were 20% off and I absolutely love them! I also bought a leopardprint scarf on Friday and am after a woolly one too-I'm a real leopardprint addict, just love it! Fabulous post, so very tempting for a lot of these items! Oh wowsers!! They are so fab.....you did well getting them with the discount!! I'd love a pair!! 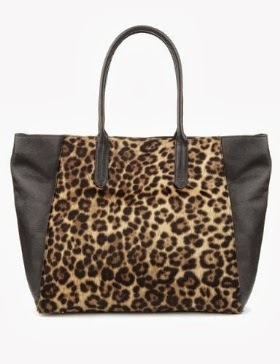 I am definitely getting myself on this leopard print band wagon!! I'm getting a bit braver and mixing up the prints a bit more.....can't believe I managed stripes and camouflage today!! I'd love to try out leopard print and tartan next! Fancy a bit of Urban fleecewear?! A tiny tweak to the current uniform!